Join clinician Travis Gray of Agape Wellness Centers share about the groundbreaking tool he created to help people more effiiciently with amazing resutts. Agape Wlelness Centers is a sponsor of the Rescue the Rescuer show. Mr. Travis Gray graduated in 2011 from Trinity International University in South Florida. He is a Licensed Mental Health Counselor (LMHC), Certified Addiction Professional (CAP), Internationally Credited Alcohol & Drug Counselor (ICADC) and a Qualified Supervisor (QS). ... See More Mr. Gray has experience working in family, group, and individual therapy, as well as in faith based settings. The majority of his mental health career has been working with the alcohol and drug addiction population. He has had great success in engaging with clients who have had chronic difficulty achieving their goals. 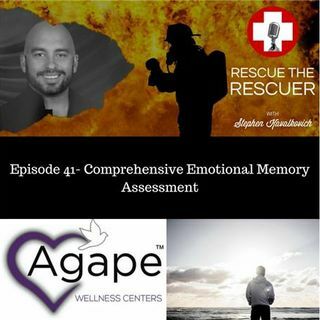 Four years ago, Travis created the Comprehensive Emotional Memory Assessment, which is a invaluable therapeutic tool to help clients understand themselves and unresolved "Heart Wounds" that perpetuate emotional pain, keeping people prone to relapse. Travis is fully bilingual in Spanish and is a veteran of the military.